You'll be £10.00 closer to your next £10.00 credit when you purchase Great Western Star Class Locomotives. What's this? Designed by G.J. Churchward, no. 40 was constructed at Swindon in April 1906. It was Swindons first 4 cylinder simple engine and was the forerunner of Churchwards famous 4 cylinder Star Class 4-6-0s. Initially built as a 4-4-2 Atlantic, no. 40 was named North Star in September 1906, rebuilt as a 4-6-0 in 1909, and renumbered 4000 in 1913. Including no. 40, the Star class eventually numbered seventy-three locomotives, all built at Swindon in batches between 1906 and 1923. In service the Stars proved to be both free-running and reliable locomotives, and for many years were used to haul the Great Westerns top link services, including the world-famous Cornish Riviera Express. The introduction of the Collett Castle Class 4-6-0s in 1923, and the King Class 4-6-0s in 1927, saw the Stars relegated to secondary passenger, freight and parcels services. A number of Stars were rebuilt by Collett as Castles, including the prototype no. 4000 North Star, but the remaining Stars continued to give good service. At Nationalisation in 1948, no less than forty-seven of these fine locomotives passed into Western Region ownership, the last example, no. 4056 Princess Margaret, being withdrawn in October 1957. In this book, Laurence Waters charts the history of the class from the prototype, right through to the final workings in October 1957. Using many previously unpublished photographs from the Great Western Trust photographic collection, accompanied by informative captions, every member of the Class is illustrated. This book should appeal to those interested in the history of Great Western locomotive development as well as modellers of the Great Western and Western Region. Laurence Waters' history is well presented. He knew the class well, and the book includes a cab view and diagram by W.A Tuplin. This book is the same high quality as the volume on the Saints. It is attractively laid out, the photographs are reproduced to high standard (with either a single or at most two per page), and the captions are informative. It goes hand in hand with the Saint book and anyone buying one should really get both. You will not be disappointed. Using many previously unpublished photographs from the Great Western Trust photographic collection, accompanied by informative captions, every member of the Class is illustrated. "Great Western Star Class Locomotives" will have special appeal to those interested in the history of Great Western locomotive development as well as dedicated railroad modelers. Impressively informative and profusely illustrated form cover to cover, "Great Western Star Class Locomotives" is certain to be an enduringly popular addition to personal, community, and academic library Railroading History collections. The work comes very well illustrated with 203 black and white photographs along with two planes of 2-6-0 with diagrams, weight, measurements and load capacities. Another visual delight for the unconditional followers of the Great Western. 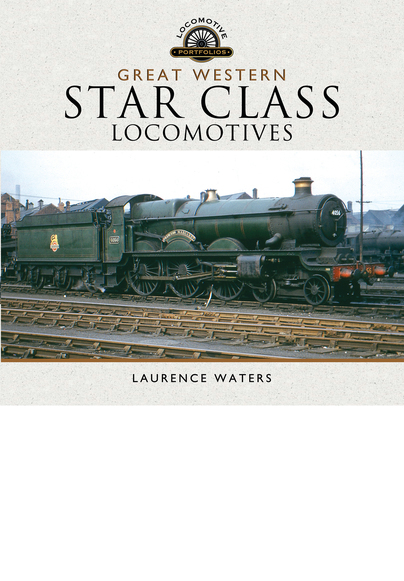 Hard on the heels of Laurence Waters' stunning book on the 'Saint' class 4-6-0s we now have the companion volume on Churchward's four-cylinder 'Stars'. You won't be disappointed with this book!